No One forgets a Woman in a Hat! Today is very special for me, because it marks 12 months since I received my own Marriage Register as a result of being licensed as a Civil Registrar of Marriages by the Cayman Islands Government. Prior to this, for 13 years I was a Deputy Civil Registrar and shared a Register with my mother, Francine, who was the first person in the Cayman Islands to be appointed as a Civil Registrar of Marriages. Here is a bit about me, not found in my profile. I was born in Grand Cayman and have lived here all my life. I was educated in Grand Cayman, Jamaica, Canada, the USA and the United Kingdom. I did my BA degree at McMaster University in Canada, and my MA degree at Durham Business School, Durham University in the United Kingdom. I have done various diplomas and certificates in other areas, namely strategic planning, management, counselling and human resource development. I am a Justice of the Peace, Notary Public and was honoured by Queen Elixabeth II with the Member of the British Empire (MBE) in 2001 for service to the Cayman Islands in the areas of education and national planning. My husband and I met at university in Canada, and we have been married for 36 years. We have 4 beautiful, well educated and successful children and 2 1/2 grandchildren. I am Roman Catholic. I love to travel and have travelled all over the world. I am an avid reader, and writer, working on the novel which everybody is supposed to have inside them. I love to cook, and I am happiest when I am in my big kitchen surrounded by children and grand-children and cooking up a storm for the many family dinners we have. I am fortunate to have the opportunity to volunteer with our Humane Society, and I am committed to working to preserve the beautiful island where I am privileged to live. Since I retired from working with the Cayman Is government almost three years ago, I have started doing wedding planning and officiating at wedding ceremonies full-time. I started wearing hats because I was on the beach all the time...now I wear them because I think they compliment my personality, happy and fun-loving, but with a serious side and make me instantly recognisable and memorable. My approach to life is simple, anything worth doing is worth doing well. 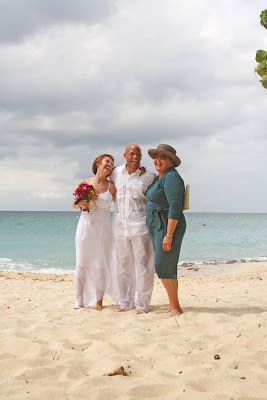 If you think I am the right person to plan and officiate at your Grand Cayman wedding, email me at mywedding@candw.ky or call me at (345)525-6551.